1- Bachelor degree in any relevant major (Engineering is preferred). 2- 3-5 years’ experience in sales construction / steel is a must. 3- Good MS Office skills. 4- Negotiation & Motivation skills. 5- Excellent command of the English language. > For who interested, kindly send your CV to: [email protected] & mention job title in the subject. 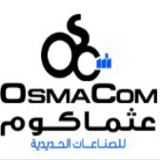 OsmaCom is an off-spring of the Osman Group of companies, dedicated to providing businesses in Egypt and the Middle East with a fast, efficient tailor made solutions that aim at setting the benchmark for excellence throughout the MENA region. Established in 2007, OsmaCom aims at fulfilling the explosive needs of the industrial sector at the desired quality and at a convenient time-frame. OsmaCom utilizes world-class technology and a pool of experts to establish new quality standards that comply with global quality standards and the various export requirements. OsmaCom has established a state of the art manufacturing center in Sadat City over a massive area of 20,000m2 to accommodate the different manufacturing specializations and ensure adherence to the highest standards of production at all times.